The portrait definitive Spanish stamps of 1889 to 1930 follow the development of King Alfonso XIII from infancy through adulthood. Due to the fact that his mother was pregnant at the time of his father's unexpected death, the infant became the King of Spain at the moment he was born. Many of the definitive postage stamps of this period exist imperforate, though most of them were not regularly issued. 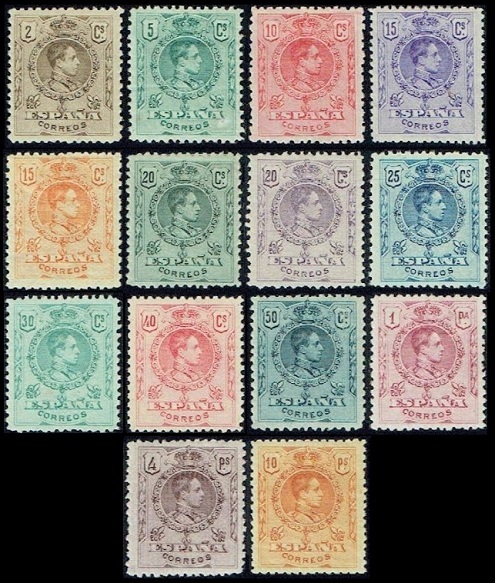 There are also quite a few definitive stamps that were prepared in trial colors but never officially placed on sale. Most of these rather expensive varieties are footnoted in the Scott catalog, but they are not given separate catalog numbers. Please see the major catalogs or the specialized Spanish stamp catalogs for further details. 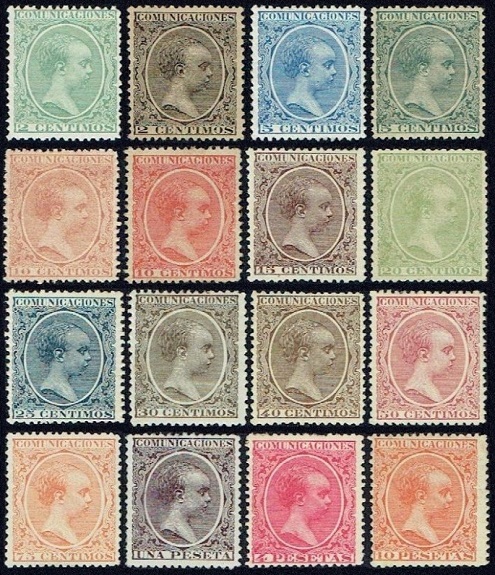 The sixteen major-type portrait definitive Spanish stamps shown above were issued between 1889 and 1899. These stamps are typographed, unwatermarked, and perforated 14. 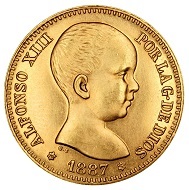 The design features a contemporary right-facing engraving of King Alfonso XIII. In October 1889, when these stamps were first issued, he was about three-years-old. The Scott catalog attributes are as follows. 02 C. (1889 - Sc. #255) - Blue Green. 02 C. (1899 - Sc. #256) - Black. 05 C. (1889 - Sc. #257) - Blue. 05 C. (1899 - Sc. #258) - Blue Green. 10 C. (1889 - Sc. #259) - Yellow Brown. 10 C. (1899 - Sc. #260) - Red. 15 C. (1889 - Sc. #261) - Violet Brown. 20 C. (1889 - Sc. #262) - Yellow Green. 25 C. (1889 - Sc. #263) - Blue. 30 C. (1889 - Sc. #264) - Olive Gray. 40 C. (1889 - Sc. #265) - Brown. 50 C. (1889 - Sc. #266) - Rose. 75 C. (1889 - Sc. #267) - Orange. 01 P. (1889 - Sc. #268) - Dark Violet. 04 P. (1889 - Sc. #269) - Carmine Rose. 10 P. (1889 - Sc. #270) - Orange Red. The 15 C. denomination in yellow is an Official stamp (Sc. #O9). The 01 P. denomination in carmine rose is an error (Sc. #268a). 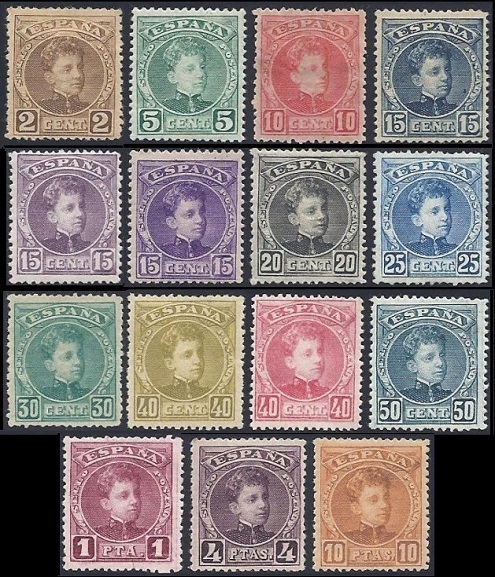 The fifteen portrait definitive Spanish stamps shown above were issued between 1901 and 1905. These stamps are engraved, unwatermarked, and perforated 14. Each stamp has a control number printed on the back side. The design features a 1900 three-quarter-facing photograph of King Alfonso XIII. In 1901, when the stamps were first issued, he was about fourteen-years-old. 02 C. (1901 - Sc. #272) - Bister Brown. 05 C. (1901 - Sc. #273) - Dark Green. 10 C. (1901 - Sc. #274) - Rose Red. 15 C. (1901 - Sc. #275) - Blue Black. 15 C. (1902 - Sc. #276) - Dull Lilac. 15 C. (1905 - Sc. #277) - Purple. 20 C. (1901 - Sc. #278) - Greenish Black. 25 C. (1901 - Sc. #279) - Blue. 30 C. (1901 - Sc. #280) - Deep Green. 40 C. (1901 - Sc. #281) - Olive Bister. 40 C. (1905 - Sc. #282) - Rose. 50 C. (1901 - Sc. #283) - Slate Blue, Blue Green (error). 01 P. (1901 - Sc. #284) - Lake. 04 P. (1901 - Sc. #285) - Dark Violet. 10 P. (1901 - Sc. #286) - Brown Orange. 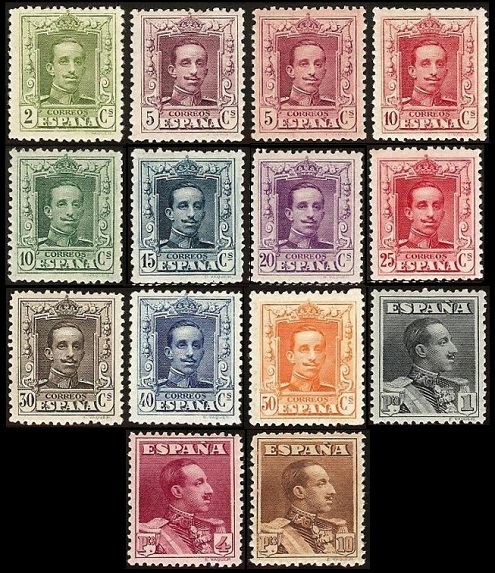 The fourteen major-type portrait definitive Spanish stamps shown above were issued between 1909 and 1922. These stamps are all unwatermarked. Each of the stamps has a control number printed on the back side. The design features a crowned wreath, containing a contemporary right-facing portrait of King Alfonso XIII. In 1909, when the stamps were issued, he was twenty-three-years-old. He had now attained his majority, and he was the king, in his own right. The Scott catalog attributes, for stamps that are engraved and have blue control numbers, are as follows. 02 C. (1909 - Sc. #297) - Dark Brown. 05 C. (1909 - Sc. #298) - Green. 10 C. (1909 - Sc. #299) - Carmine. 15 C. (1909 - Sc. #300) - Violet. 15 C. (1917 - Sc. #310a) - Yellow Ocher. 20 C. (1909 - Sc. #301) - Olive Green. 20 C. (1921 - Sc. #317) - Violet. 25 C. (1909 - Sc. #302) - Deep Blue. 30 C. (1909 - Sc. #303) - Blue Green. 40 C. (1909 - Sc. #304) - Rose. 40 C. (1918 - Sc. #313) - Light Red. 50 C. (1909 - Sc. #305a) - Slate Blue. 50 C. (1922 - Sc. #305) - Blue. 01 P. (1909 - Sc. #306) - Lake. 04 P. (1909 - Sc. #307) - Deep Violet. 10 P. (1909 - Sc. #308) - Orange. The Scott catalog attributes, for stamps that are engraved and have red or orange control numbers, are as follows. 15 C. (1917 - Sc. #310) - Yellow Ocher. The Scott catalog attributes, for stamps that are lithographed and have blue control numbers, are as follows. 02 C. (1920 - Sc. #315) - Bister. 20 C. (1920 - Sc. #316) - Violet. 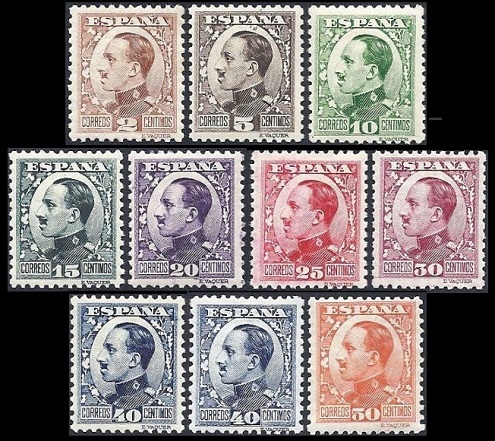 The fourteen major-type portrait definitive Spanish stamps shown above were issued between 1922 and 1926. These stamps are all engraved and unwatermarked. Each of the stamps, except for the 2 C. denomination, has a control number printed on the back side. The designs feature two contemporary portraits of King Alfonso XIII. 02 C. (1922 - Sc. #331) - Olive Green. 05 C. (1922 - Sc. #332) - Red Violet. 05 C. (1922 - Sc. #333) - Claret. 10 C. (1922 - Sc. #334) - Carmine. 10 C. (1922 - Sc. #335) - Yellow Green. 10 C. (1923 - Sc. #335a) - Blue Green. 15 C. (1922 - Sc. #336) - Slate Blue, Black Green. 20 C. (1921 - Sc. #337) - Violet. 25 C. (1922 - Sc. #338) - Carmine, Rose Red. 30 C. (1926 - Sc. #339) - Black Brown. 40 C. (1922 - Sc. #340) - Deep Blue. 50 C. (1922 - Sc. #341) - Orange, Orange Red. 01 P. (1922 - Sc. #342) - Blue Black. 04 P. (1922 - Sc. #343) - Lake. 10 P. (1922 - Sc. #344) - Brown. The 10 C. (yellow green), 15 C., and 25 C. denomination stamps exist in two major types. The 2 C. denomination in deep orange and the 25 C. denomination in lilac rose are errors. Please see the major catalogs for details. The ten major-type portrait definitive Spanish stamps shown above were issued during 1930. These stamps are all engraved and unwatermarked. Each of the stamps, except for the 2 C. denomination, has a control number printed on the back side. 02 C. (1930 - Sc. #406) - Red Brown. 05 C. (1930 - Sc. #407) - Black Brown. 10 C. (1930 - Sc. #408) - Green. 15 C. (1930 - Sc. #409) - Slate Green. 20 C. (1930 - Sc. #410) - Dark Violet. 25 C. (1930 - Sc. #411) - Carmine. 30 C. (1930 - Sc. #412) - Brown Lake. 40 C. (1930 - Sc. #413) - Dark Blue. 50 C. (1930 - Sc. #414) - Orange. The 40 C. denomination stamp exists in two major types. Please see the major catalogs for details. Alfonso León Fernando María Jaime Isidro Pascual Antonio de Borbón y Habsburgo-Lorena (1886-1941) was the son of King Alfonso XII (1857-1885) and Queen Consort Marie Christina of Austria (1858-1929). He reigned, as King Alfonso XIII, from the moment of his birth until the proclamation of the Second Republic in 1931. His mother served as the regent, until he assumed full powers on his sixteenth birthday, on May 17, 1902. The disastrous Spanish-American war took place early in the reign of Alfonso, but that can hardly be blamed on the twelve-year-old king or his regent. 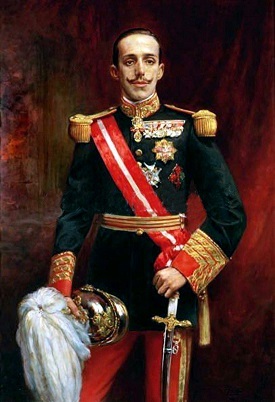 During the later part of the monarchy of King Alfonso XIII, Spain experienced major problems, such as the lack of political representation by all social groups and poverty across all classes, particularly the peasantry. These social problems, combined with the brutal dictatorial government of Prime Minister Miguel Primo de Rivera (1870-1930), would bring about the fall of the Spanish monarchy and the beginning of the Spanish Civil War during 1931. On April 14, 1931, the Spanish royal family fled the country, settling in Rome. The nationalists, under the leadership of General Francisco Franco, eventually defeated the republicans in the Spanish Civil War, however the nationalists refused to restore Alfonso as the king. King Alfonso XIII died in Rome on February 28, 1941, and he was buried there. The monarchy was again restored in 1975, following the death of Francisco Franco (1892-1975) and the enthronement of King Juan Carlos I (b. 1938). The remains of King Alfonso XIII were transferred to the Pantheon of the Kings in the Monastery of El Escorial, near Madrid, in 1980. The 01 C. denomination stamp shown above (Sc. #314) was issued in June 1920. This stamp is typographed, unwatermarked, and imperforate.